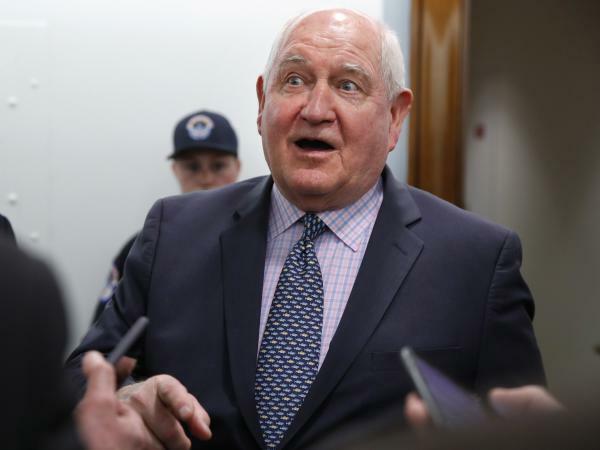 Agriculture Secretary Sonny Perdue and other USDA officials say the aid will be available in three forms; direct payments; government purchases for distribution to food banks; and development of new export markets. During a speech to the VFW in Kansas City, Mo., President Trump said farmers "will be the biggest beneficiary" of his tariffs, and he urged them to "just be a little patient." China, the European Union, Canada and Mexico have all been hit by U.S. levies on imports including steel and aluminum and have retaliated by placing their own tariffs on U.S. agricultural exports, thus targeting farm states that are politically important to the president. 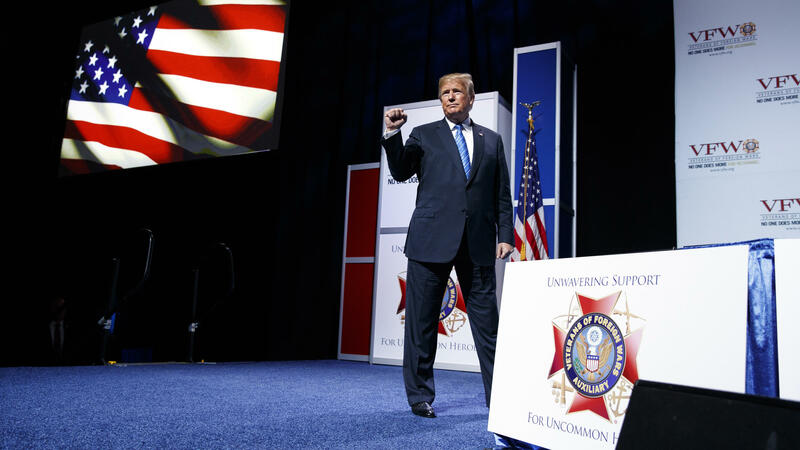 During a speech to the Veterans of Foreign Wars in Kansas City, Mo., President Trump said his tariffs are working and bringing nations to the bargaining table. Trump said farmers "will be the biggest beneficiary," and he urged them to "just be a little patient." Perdue and other USDA officials say the aid will be available in three forms; direct payment to producers of soybeans, sorghum, wheat, cotton, dairy and hogs; government purchases of fruit, nuts, legumes, and some meats for distribution to food banks; and development of new export markets. Officials say they will be using a Depression-era program, the Commodity Credit Corporation, to secure money from the U.S. Treasury and will not need to ask Congress for the funds. Farm state lawmakers and other groups quickly criticized what they called a bailout. Sen. Ben Sasse, R-Neb., said the administration's trade war "is cutting the legs out from under farmers and White House's 'plan' is to spend $12 billion on gold crutches." Taxpayers for Common Sense called the announcement "a recipe for disaster that would undo decades of progress toward weaning agriculture from financial dependence on federal subsidies." The White House is coming to the aid of farmers hurt by its own hard-line trade policies. The Trump administration says today it will make an estimated $12 billion in government assistance available. That includes direct payments to growers. The announcement came from Agriculture Secretary Sonny Perdue. NPR's Brian Naylor joins us in the studio now. Hey there, Brian. BRIAN NAYLOR, BYLINE: Hi, Audie. CORNISH: What reason did the administration give for doing this? NAYLOR: Well, farmers, especially hog farmers and soybean growers in red states, have felt the brunt of the retaliatory tariffs placed on agriculture by China and other nations which the Trump administration has penalized with tariffs on their exports. China, the EU, Canada, Mexico - they've all been hit by U.S. levies on some of the products they send to the U.S., including steel and aluminum. And so they've retaliated, placing their own tariffs on U.S. agricultural exports and targeting farm states that have supported the president and Republican lawmakers in general. So Agriculture Secretary Sonny Perdue said today that the aid would show that the president has the farmers' backs. SONNY PERDUE: The programs we're announcing today are a firm statement that other nations cannot bully our agricultural producers to force the United States to cave in. CORNISH: ...Him in a speech talking about how this is going to really make a difference and open up markets. So what is the message being sent now by the action of providing emergency aid? NAYLOR: Yeah, it's interesting. I mean, he seems to be saying, yeah, they're great, but they're going to cause some parts of the American economy to suffer at least for now. Here's how he put it today in Kansas City, where he was addressing the VFW Convention. He said the tariffs are bringing countries to the table. PRESIDENT DONALD TRUMP: Making tremendous progress - they're all coming. They don't want to have those tariffs put on them. They're all coming to see us. And the farmers will be the biggest beneficiary. TRUMP: Watch. We're opening up markets. You watch what's going to happen. Just be a little patient. NAYLOR: So just be a little patient seems to be the message. There will be some short-term pain but long-term gain. CORNISH: Questions about the money - how will it be spent? We're talking 12 billion. Where did it come from (laughter)? CORNISH: And is Congress involved? NAYLOR: Well, so the administration says, no, we don't need congressional approval because they're going to use a Depression-era program called the Commodity Credit Corporation to draw the funds from the Treasury. And as USDA officials explain, there will be three forms of aid - direct payments to some farmers, including soybean and dairy and hog producers. Some of it will be used to buy surplus crops from other farmers - fruits and nuts and some meats. And that will be given to food banks. Some of our listeners might remember the government cheese program back in the '70s. Audie, I know you don't. NAYLOR: But it's that same program. And some of the money will also be used to develop new markets for export. CORNISH: I can't imagine lawmakers don't have something to say about it, though. NAYLOR: Yeah, so Congress doesn't have to approve it, which is probably a good thing because the response so far hasn't been very positive. The farmers are hurting because of the Trump trade policies on one hand. And on the other hand, they don't want the government bailing them out. Republican Senator Ben Sasse of Nebraska, who's often been a critic of the president, said the administration's trade war is cutting the legs out from under farmers, and the White House's plan is to spend $12 billion on gold crutches. Others are saying, hey, what about my state? You know, why are you singling out farmers? Alaska Senator Lisa Murkowski says the tariffs are hurting her state's seafood industry and wonders where you draw the line. Senator Ron Johnson, a Republican from Wisconsin, told reporters it's becoming more and more like a Soviet type of economy here. So whether the grumbling goes any further remains to be seen. CORNISH: That's NPR's Brian Naylor. Brian, thank you. NAYLOR: Thanks Audie. Transcript provided by NPR, Copyright NPR.